Shift the balance ‘in favour of ‘the home team’ by switching to quality Irish products in your local shops in Ballina. 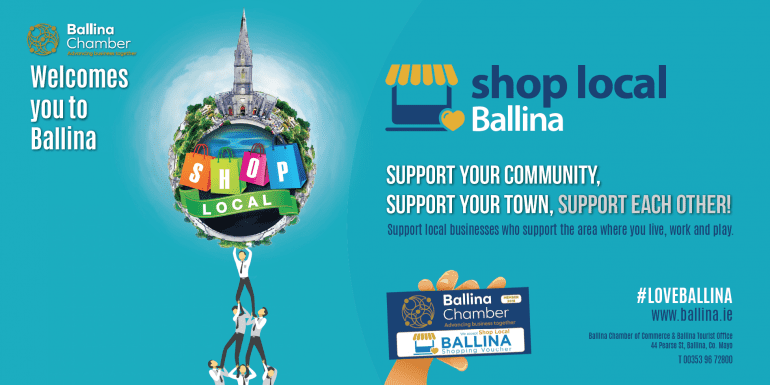 Ballina Chamber of Commerce has made an appeal to hard pressed consumers to make an effort and ‘shop for Ballina’ in your local town and region where possible to ensure that local jobs are retained. While acknowledging the reduced financial circumstances of all our citizens and the necessity to cut back on spending this year, it is encouraged shoppers to ‘BUY IRISH’ where and when they can. Every €10 spent locally on Irish products generates €24 of benefit to the local community. 45 cents of every Euro spent is reinvested locally in comparison to only 15cents for the foreign multiples. According to ISME Chief Executive, (Irish Small and Medium Enterprises Association) , Mark Fielding states “Each time we spend a euro, we would do well to weigh the full value of our choices, not solely to ourselves immediately, but for the future we want for our children in our own towns and villages”.